I was watching BBC and saw a Shanghainese chef serving this Chinese Braised Pork Belly 红烧卤肉 to an European guest. 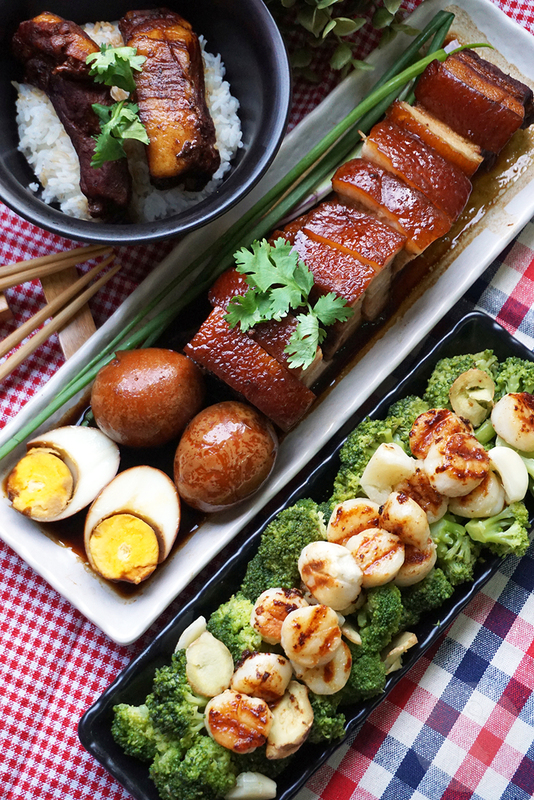 This reminded me that I had not cooked this Chinese classic for the longest time. Before I change my mind or procrastinate further, I decided to put this on my table the very next day! 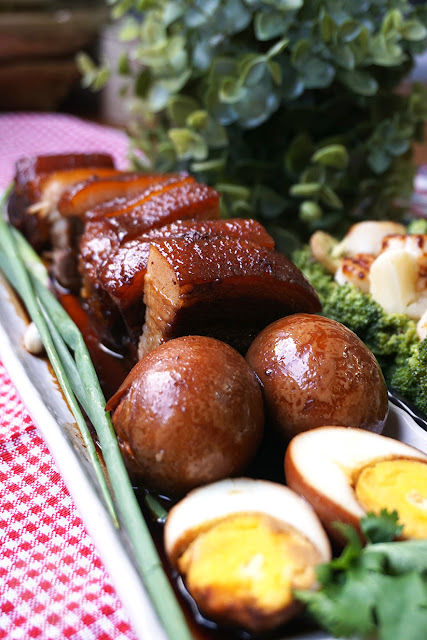 The Chinese Braised Pork Belly 红烧卤肉 is relatively easy to prepare. It is almost like a one-pot dish less the greens. 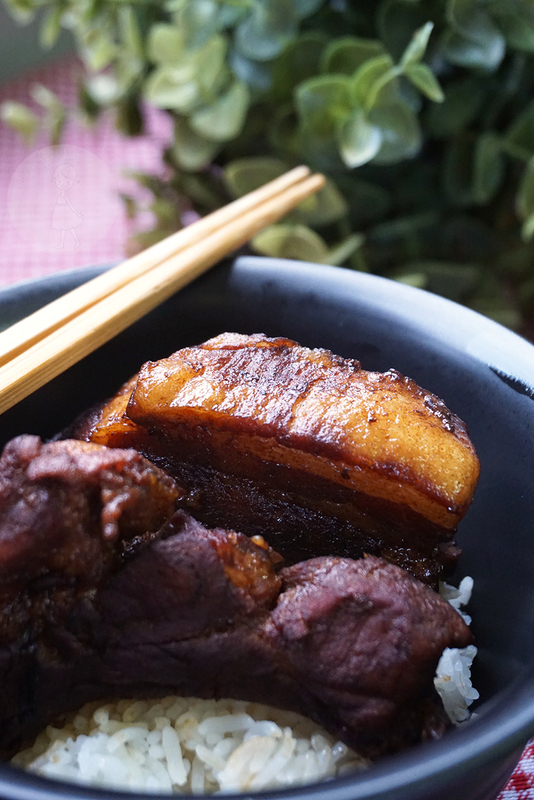 It is definitely satisfying to go with steamed rice. We can surely forget about dieting when savouring this fulfilling dish! 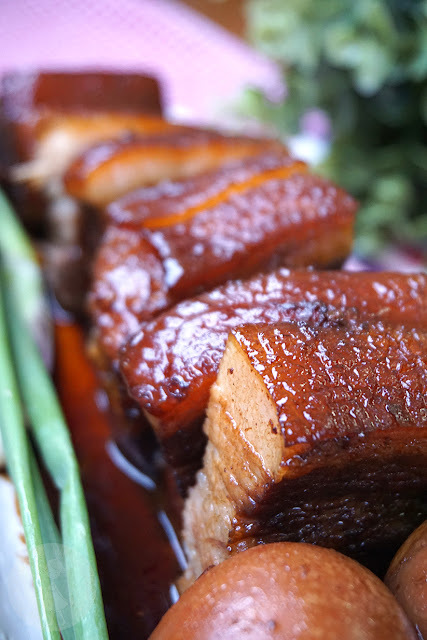 Lightly season pork belly by rubbing a little salt on surface and skin. Set aside for 10-15 minutes. Heat pot with cooking oil at medium heat. (Suggest to use a smaller sized claypot or cast iron pot. I used a 18 cm pot. 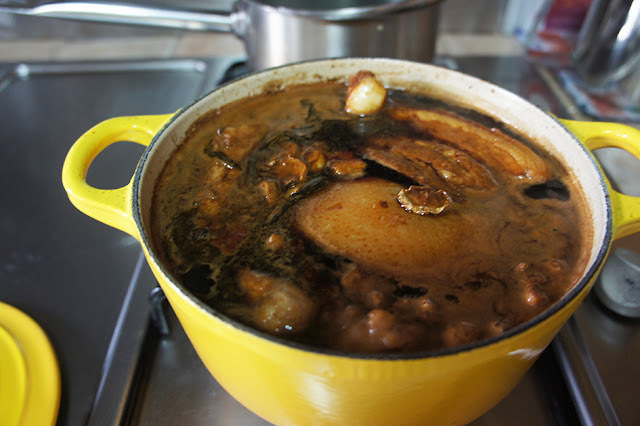 Should you decide to use a larger pot, please adjust seasonings, rock sugar and taste accordingly as pork need to be totally submerged while braising. And if you have to add more water, you do not want to compromise on taste as well). Toss in cinnamon stick, star anise, ginger slices and big chunk spring onions and quick stir fry till aromatic. Add garlic later for quick stir fry. Fold in Pork and pan sear till all sides turn a little brownish. Mix all seasonings in a bowl and slowly pour into pot. Top up with water to totally submerge pork belly. 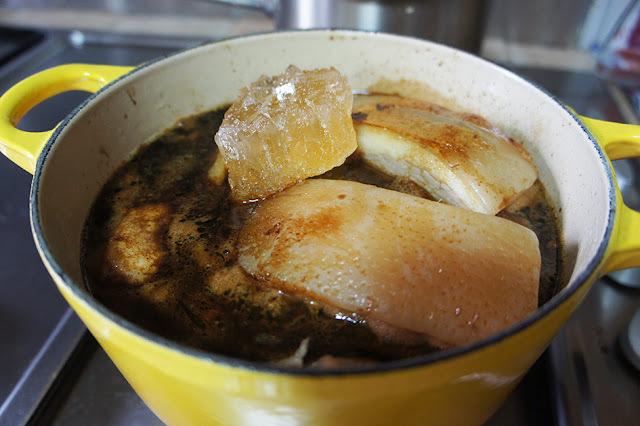 Add rock sugar and ikan bills stock cube into pot. Ensure pork belly is totally submerged. Cover lid and allow to simmer till boiling point. Open lid and taste test. Adjust seasonings and tastes accordingly. Braise for minimum 1 hour or till meat turns tender (mine took about 1.5 hour). Add hard boiled eggs into pot 20 minutes before turning off heat. 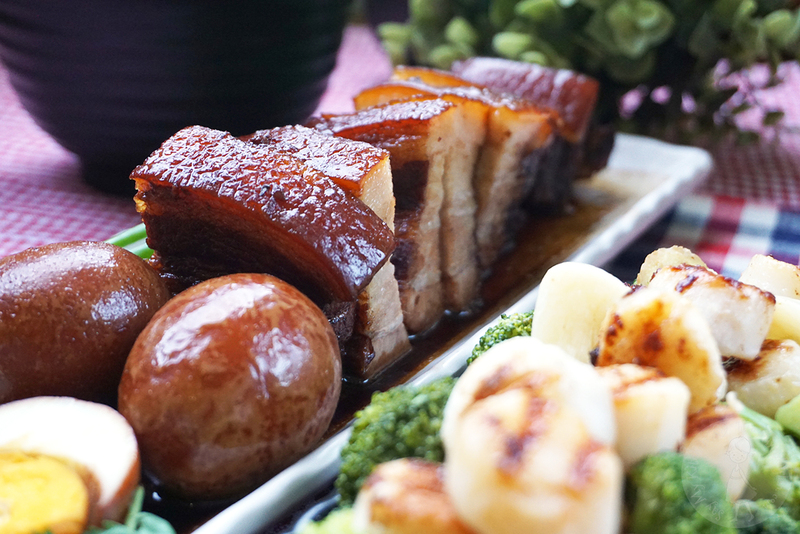 Cut pork belly to thick slices and transfer to serving plate with sauce when satisfied with texture. Garnish with chopped spring onions before serve. Unlike our popular Malay Satay, this Satay Bohong 娘惹沙爹 is not a common satay dish we find in Singapore. 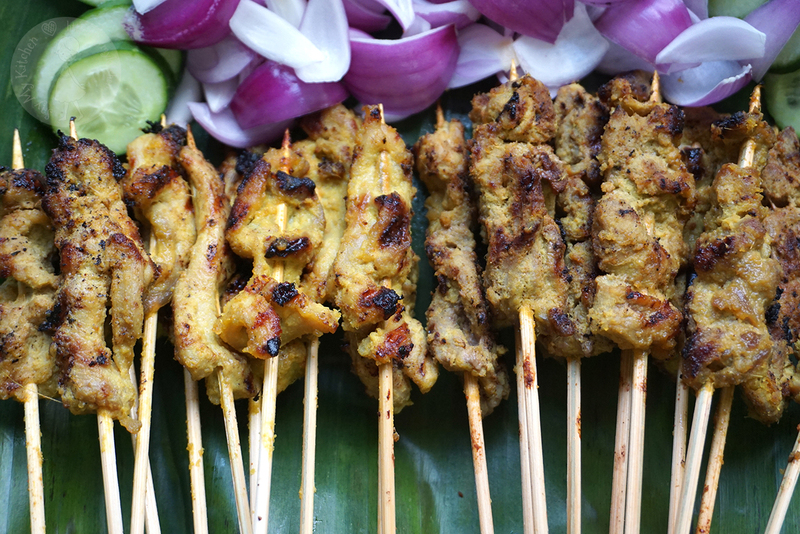 How is Satay Bohong different from our Malay Satay? 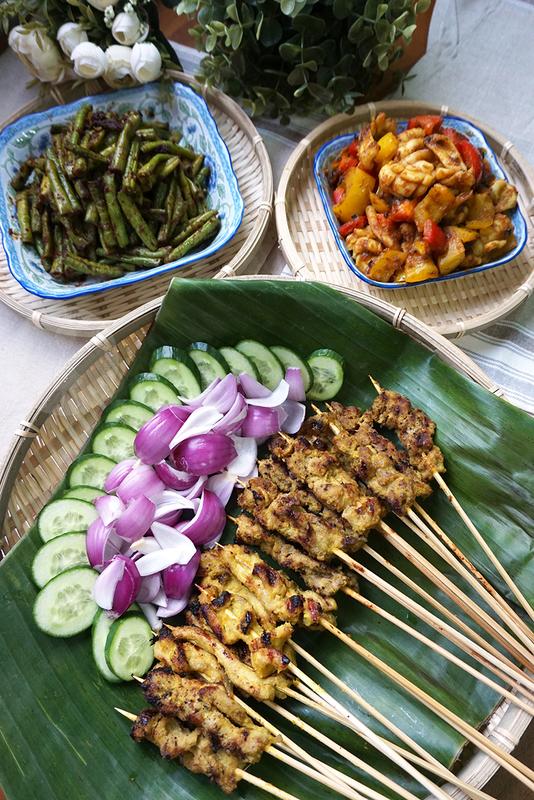 Well, the most distinctive characteristics being Satay Bohong does not require the peanut dipping sauce! 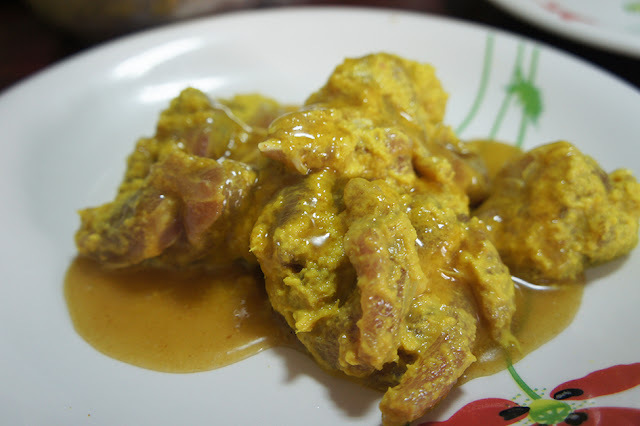 Satay Bohong 娘惹沙爹 or Batu Maung Satay (its other name) is traditionally found in Penang amongst Northern Peranakan. 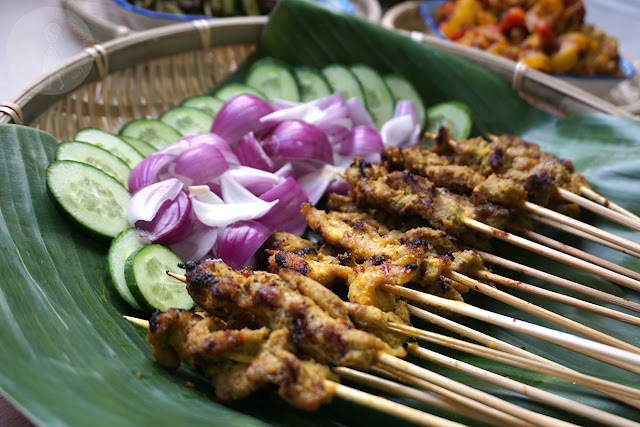 In this version, the sauce and peanut flavours are already marinated and infused into the meat before skewered and grilled. 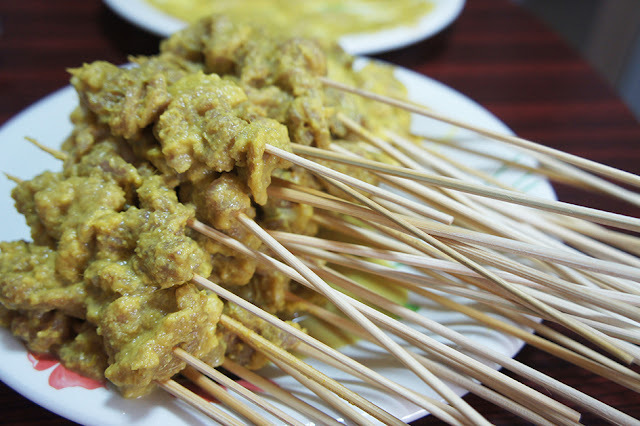 Without the traditional peanut dipping sauce, some people call it the "fake satay", a literal translation from the Malay word "bohong" (meaning fake or lie). 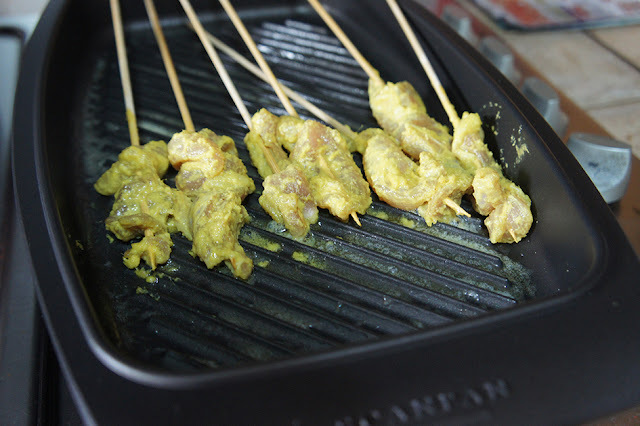 For my homemade satays (especially when I have to serve them in home parties), I always prefer this less messy version. My guests do not have to look for dipping sauce and I do not have to go around checking if the floor is dirtied and stained by the peanut sauce. It's surely convenient for the guests and easy for me. 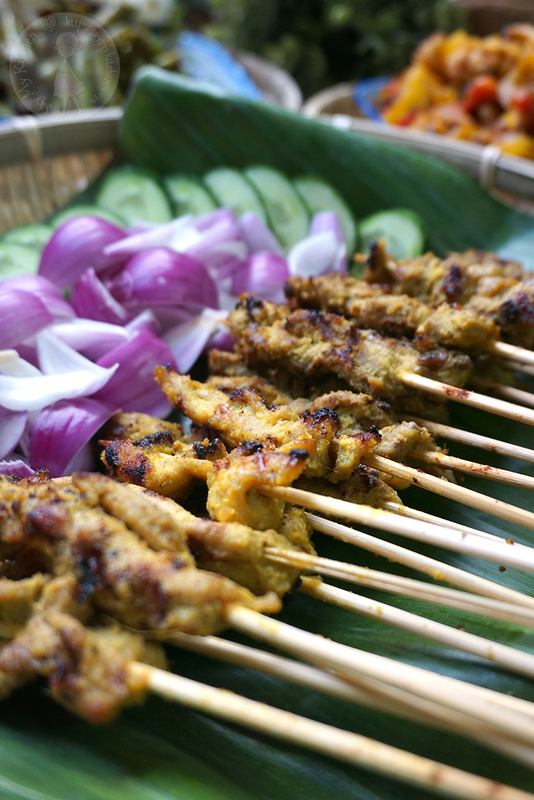 Rest assured that the Satay Bohong 娘惹沙爹 is no lesser in flavours and tastes. I seriously do not mind if this is real or fake satay anymore! 1 kg of meat (sliced to bite size)(I used 400g boneless chicken thigh meat, 400g beef and 200g pork. Chicken tasted best of the 3 and I prefer beef over pork for taste and texture. In my opinion, can omit pork next time). 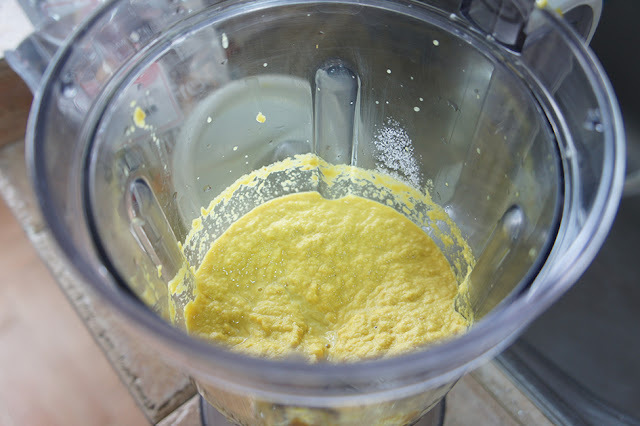 Blend or pound all ingredients in Group A.
Marinate all sliced meats with Group A ingredients in chiller for 1 hour. 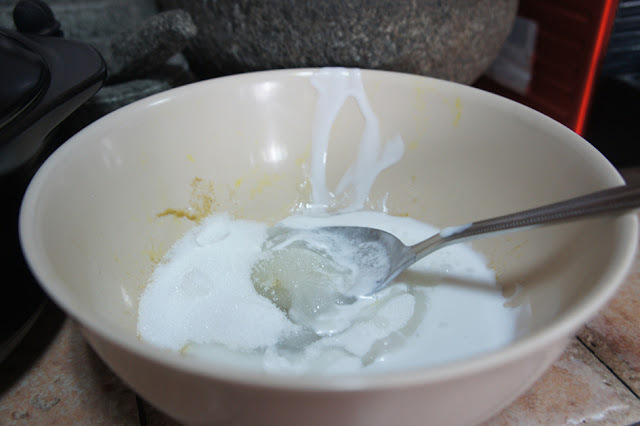 Meanwhile, prepare Group B ingredients. An hour later, remove meats from chiller. Add Group B ingredients and ensure all meats are evenly coated with both Group A and Group B ingredients. 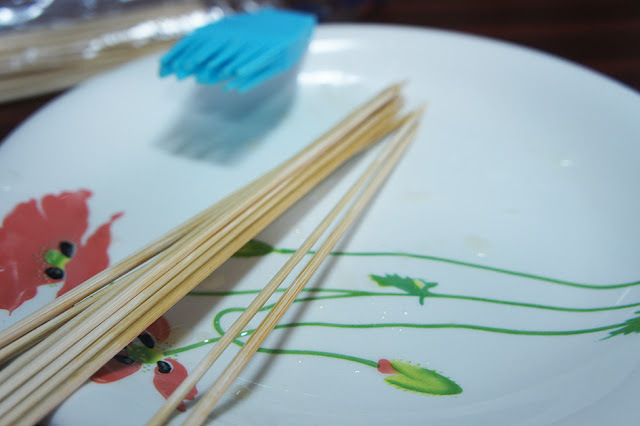 Skew all meats with bamboo sticks. Turn on medium heat. Brush a little butter or oil to grease grill pan. Grill meat skewers on grill pan till fully cooked. Note : The traditional method is to blend the peanuts to Group B ingredients and apply just before grill. I tweaked it a little to apply it in my Group A seasonings. Follow the traditional method if you prefer. The Satay Bohong 娘惹沙爹 is a relatively straight forward dish to prepare. The only complexity lies with identifying and application of multiple spices. For many locals, we should have no major issues in preparing this well-loved dish. 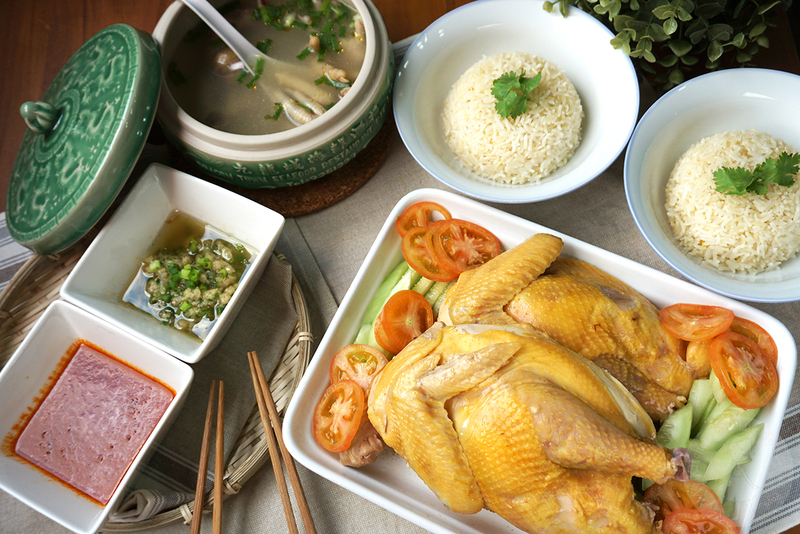 I think many would agree that Hainanese Chicken Rice 海南鸡饭 is almost like a national dish of Singapore. We see them, breathe them, eat them and enjoy them from heartlands to 5-star hotels. Many of us would be able to tell at first sight and first bite - whether the dish meets our high expectations. 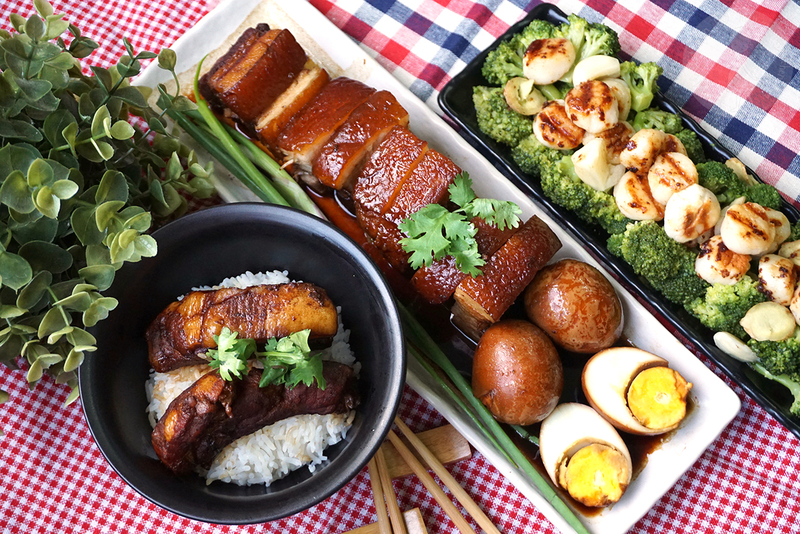 Be it home cooked or those served in hawker centres, coffee shops, cafes and restaurants. The chicken selection process determines largely whether the meat would be nice and tender. 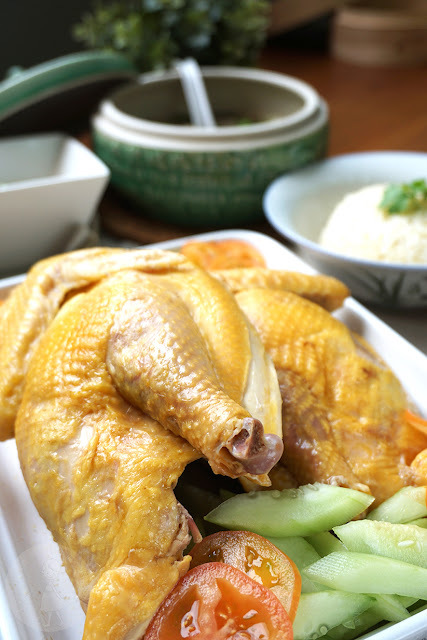 In my family, we would only use Kampong Chicken (free range chicken) for making Hainanese Chicken Rice 海南鸡饭. The more yellowish the chicken skin, the better! 黄油鸡 or the "yellowish skin chicken" almost guarantee juicy and succulent meat when cooked. 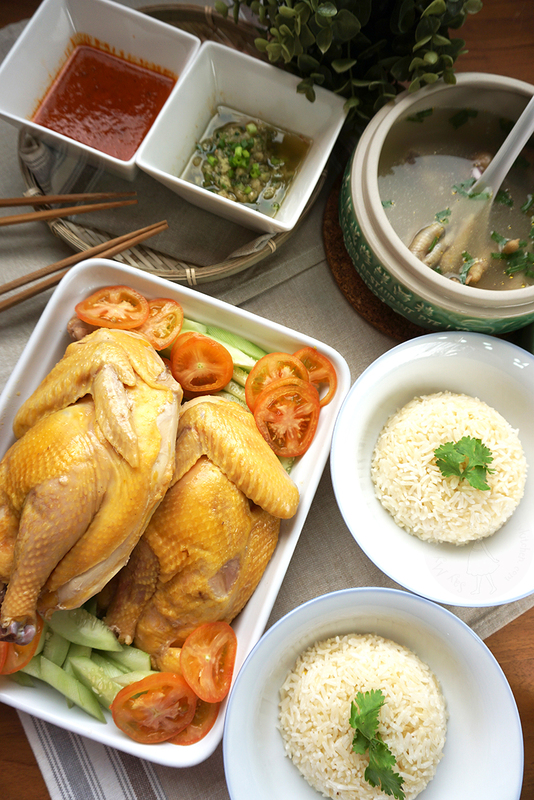 The traditional way of preparing Hainanese Chicken Rice 海南鸡饭 is using the poaching method. As we get busier with other things in life and as kitchen appliances advances, we now have more viable methods to prepare the dish. 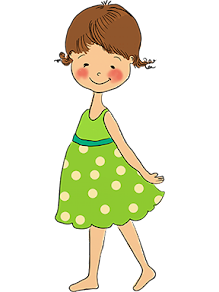 I have listed 3 methods in this post. Namely, the poaching method, the steaming method and the sous vide method. I have attempted all 3 and each has its pros and cons. 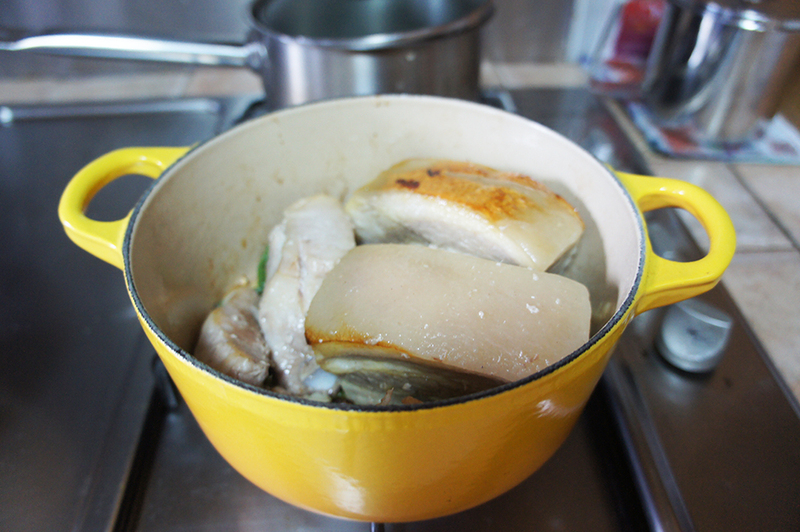 If you are particular about achieving smooth chicken skin, go for the poaching method. 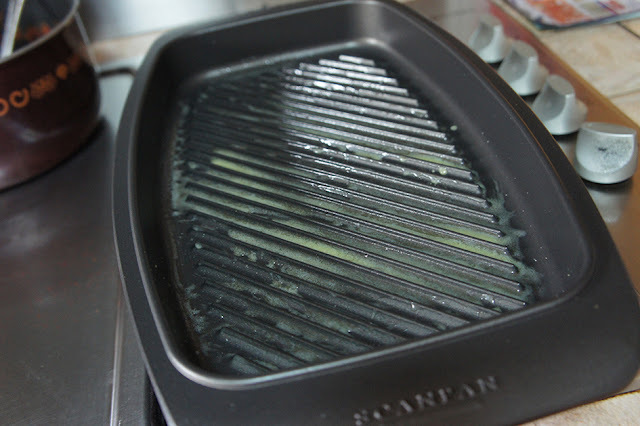 If you want a more fuss free method, go for steaming. If you want absolutely tender and juicy chicken meat, you cannot go wrong with the sous vide method. The essential elements of a tasty Hainanese Chicken Rice Meal 海南鸡饭餐 include the chicken, the soup, the rice and the condiments. The absence of any element would make the meal incomplete! And the experience would not be so fulfilling. Rub a little salt on surface of chicken to remove impurities on skin. Wash and clean chicken and pat dry. Pre-marinate chicken beforehand by rubbing sea salt on the surface and the cavity. Use a deep pot to boil enough water to soak in the whole chicken. Toss in some ginger slices, garlic cloves and spring onions to boil as well. Turn off fire when water is boiled. Immediately dip chicken into hot water (let entire chicken soak in).Poach chicken in hot water for 5 minutes. Meanwhile, prepare a large bowl of ice water. When ready, remove chicken from pot and immediately dip it into ice water bowl. Turn on fire again. Dip chicken back into hot water (let entire chicken soak in). Poach chicken for 20-25 minutes (depending on size of chicken, the smaller size, the shorter time needed) until chicken is 90% cooked. When chicken is 90% cooked, remove chicken from pot and immediately dip into ice water bowl for ice bath again. Let it stay for 10 minutes. Remove chicken from ice bath. 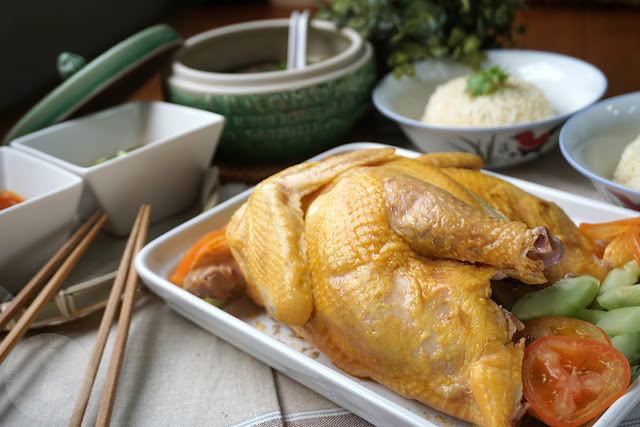 Allow chicken to rest on plate for 30 minutes to 1 hour before chopping and serve with dressing (dressing is a mixture of light soy sauce and sesame oil). 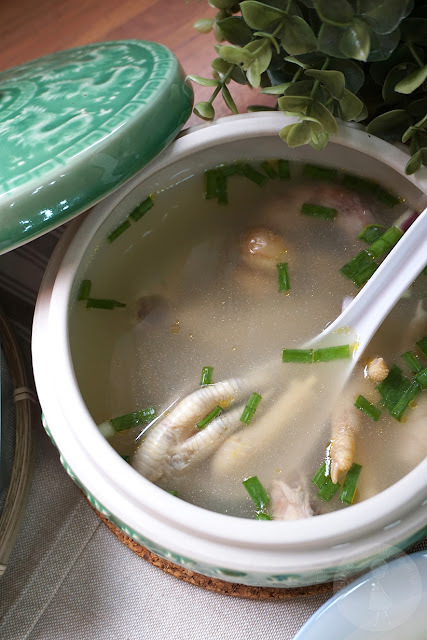 Insert ginger slices, garlic cloves and spring onions into chicken carcass/cavity. Steam chicken for 20-30 minutes (depending on size of chicken) till 90% cooked. Remove chicken from pot and dip into ice water for ice bath for 10 minutes. Insert ginger slices, garlic cloves and spring onions into vacuum bag together with chicken. Add a few drops of sesame oil into the bag. Cook in sous vide at 68C or 155F for 2.5 hours or 90% cooked. Remove chicken from sous vide water oven. Remove chicken from sealed bag and allow to rest on plate for 30 minutes to 1 hour before chopping and serve with dressing (dressing is a mixture of light soy sauce and sesame oil). At medium heat, quick stir fry aromatics (ginger slices, garlic) in pot with a little cooking oil and chicken fat. Toss in chicken bone/parts for a quick stir fry. Add water and chicken stock cube into pot and allow it to boil. Upon reaching boiling point, turn to low-medium heat and simmer for minimum 1 hour. Add salt (to taste), chopped spring onions and few drops of sesame oil before serve. Wash and drain rice grains. 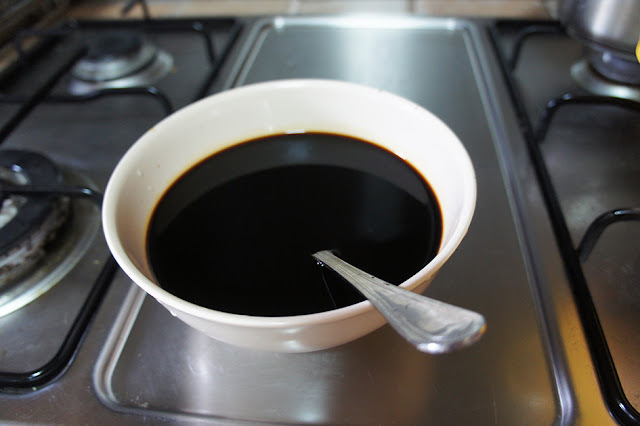 Add a little cooking oil, sesame oil and chicken fat to stir fry for few minutes until the chicken fat renders and fragrance emits. Toss in ginger slices and garlic and quick stir fry till aromatic. Fold in rice grains for a quick stir fry until the grains turn translucent. This would mean the rice grains are soaking up the aromas from the chicken fat and aromatics. Transfer rice and aromatics to rice cooker. 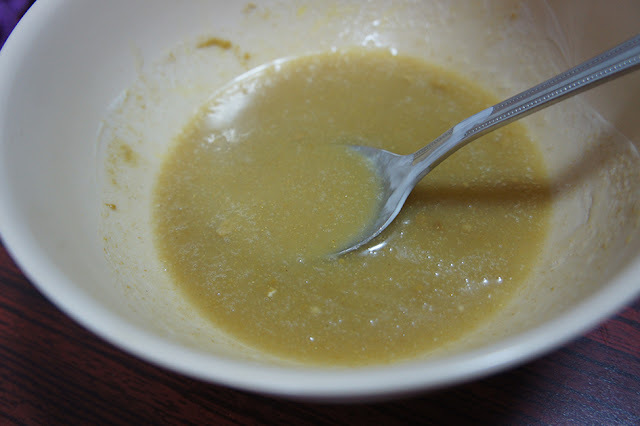 Instead of using water to cook rice in rice cooker, replace water with the chicken stock/soup that were prepared earlier. Add pandan leaves and a little salt (to taste) into rice cooker. Cook rice as per your rice cooker’s instructions. 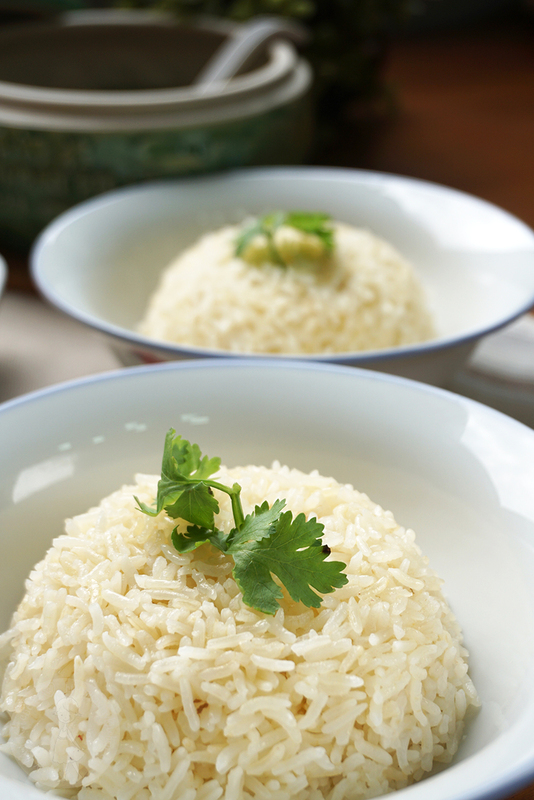 When rice is fully cooked, give the rice a thorough stir to ensure the fragrance are evenly infused. Combine grated ginger and finely chopped spring onions into a bowl. Boil 3-4 tbsp cooking oil in pan/pot (I used oil from deep frying my onions). 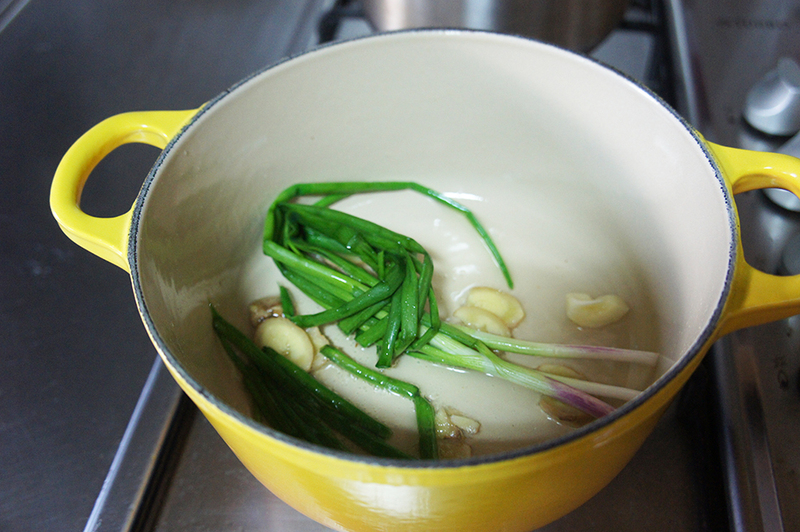 Pour hot boiled oil onto bowl that contains ginger and spring onions. You should hear a sizzling sound when pouring the oil. Be careful of splattering oil. Allow to cool down, add a little sesame oil and salt (to taste). Serve as ginger dip for chicken. 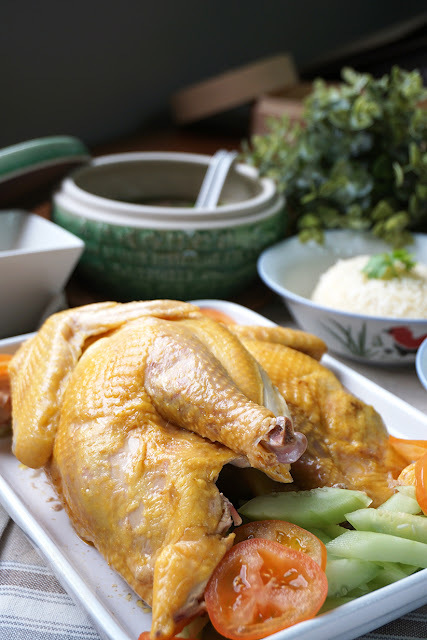 This Hainanese Chicken Rice 海南鸡饭 meal was definitely enjoyable and fulfilling for my family. 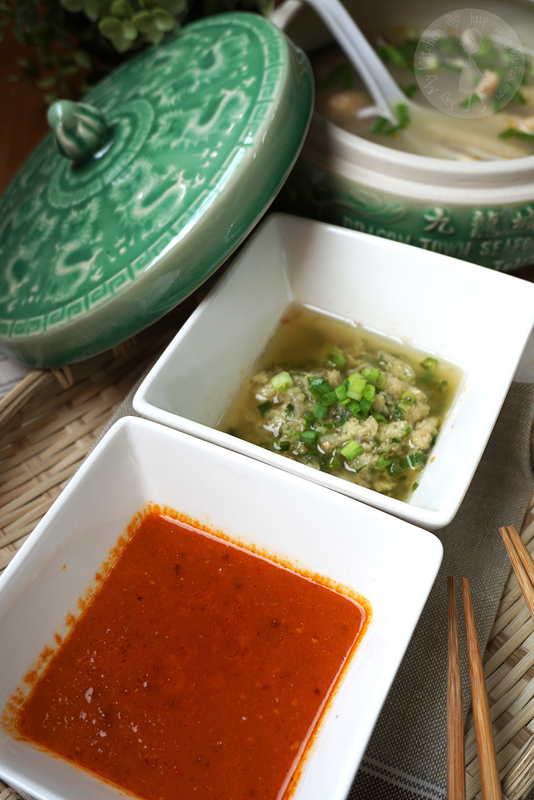 The fragrance emitted from the chicken and rice, plus the pairings of condiments were simply mouthwatering!